Your church or organization’s shared team values set the tone for your workplace culture. In fact, they are the bedrock upon which your culture is built. Your workplace values are the shared guiding beliefs and principles that are most important to your team about the way you work. They help you choose between right and wrong and guide employee decisions, attitudes, and actions. They clarify the desired behaviors of employees and the expectations of how employees relate to each other on a day to day basis. Respecting organization policy and rules. To be successful, individual employee values must be closely aligned with the organization’s workplace values. When this happens, people understand one another, everyone does the right things for the right reasons, and this common purpose and understanding helps people build healthy working relationships. 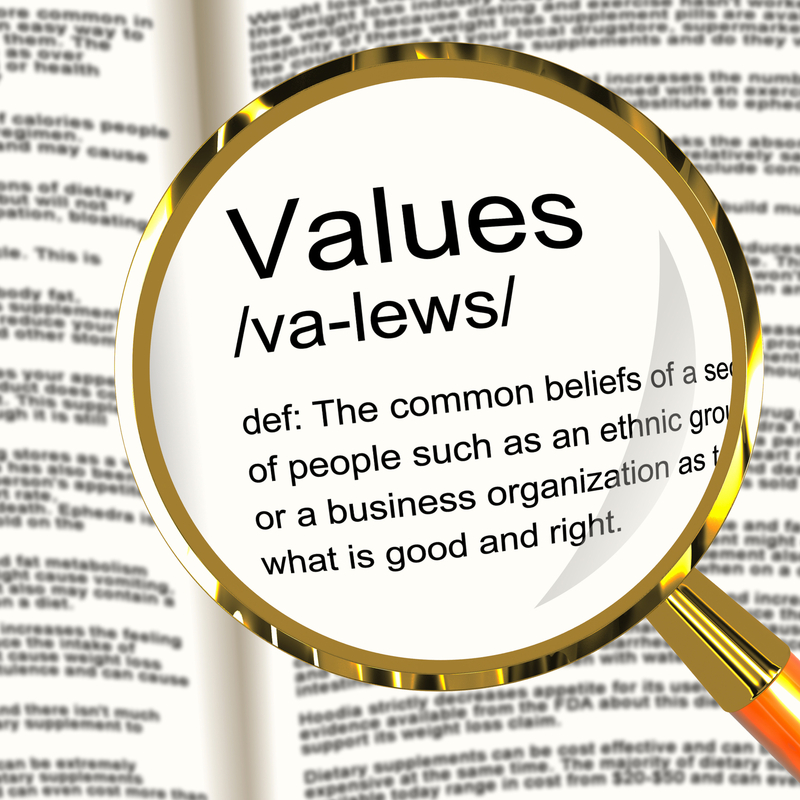 Values alignment helps the organization as a whole to achieve its core mission. When values are out of alignment, people work towards different goals, with different motives, and with different outcomes in mind. This can damage work relationships, job satisfaction, and productivity. Developing team values is not a waste of time….the best organizations without fail have strong cultures that revolve around desired behaviors stated as core or shared values. This exercise helps you as a leader to establish a set of shared values and related desired behaviors. To have shared values in a team will: create better understanding and communication; help people to function and work better together and feel better about what they do; create better co-operation and alignment of people towards common mission, vision, and goals. Purpose: To develop a set of team values related to how we collectively agree to relate to one another in the work environment and succeed as a team. First, your team must determine the types of behaviors that are desirable and those that are not. Think about the types of behaviors and attitudes that you find agreeable and enjoyable in your work environment and that accelerate and support your work. Consider as well the types of behaviors and attitudes you find annoying or troubling and that block or inhibit your work. In addition, think about the beliefs and behaviors that you strive to model in your own work related responsibilities and relationships. Use the list of potential values below to stimulate your thinking. Listen closely to the actions and attitudes that are desired and those that are not welcomed that are offered by others on your team. Doing so will help you understand and appreciate what is important to your fellow team members. Think of these as actions and attitudes that inhibit and discourage your work……that you find annoying, bothersome, or troubling. Write down 2-5 specific examples on separate index cards. After everyone is done writing, place the completed index cards in the center of the table. Go around the table and have each person draw a card and read aloud the undesired value until all the statements are read. Take note of the undesired values that are consistently repeated. Think of these as actions and attitudes that support and encourage your work…..that you find inspiring, agreeable, or enjoyable. Write down 2-5 specific examples on separate index cards. Try to counter the “I don’t like it…..” statements shared in STEP 2 with a corresponding positive value. After everyone is done writing, place the completed index cards in the center of the table. Go around the table and have each person draw a card and read aloud the desired value until all the statements are read. Take note of the desired values that are consistently repeated. Discuss the desired values in terms of behavior and attitudes and the results that will follow if people live out this value. These statements provide a simple list of positive behaviors that are currently valued by your team. If the list is longer than 10 values, conduct a ranking exercise where each team member rates their Top 10 values in order of preference, so that the least favorite gets one point, the next least favorite gets two points, and so on. For example, your top choice gets ten points, your second choice gets nine points, your third choice gets eight points, etc. Collect everyone’s rankings and add up their scores for each option, to form a collective response. This gives the group’s consensus score for each option. Then order the options so that the one with the highest score is at the top of the list. Designate a sub-team of 2-3 individuals to compile and wordsmith the “I like it……” shared values into a Team Values Chart. The chart should include a one or two word description of the value and a bullet point description of several behaviors and attitudes that might encourage and support each value. o We are proactive in taking initiative to share information with each other. o We bring issues to the table and speak honestly and openly about our position and feelings. o We challenge each other respectfully. o We support and encourage each other in frank and honest conversation. Once the Team Values Chart is completed, gather your entire team and ask for suggested edits. Have the group reflect on what was the major thing they learned and took away from this exercise. When there is agreement, ask the team if they can commit to live by these values and wanted behaviors. Ask also if they will graciously accept receiving reinforcing feedback from other team members if they live by them and re-directive feedback if they don’t live by them. Consider having each team member sign the shared values as a team covenant. Publish and distribute the finalized Team Values Chart. Publishing your shared values on attention-grabbing posters around the office is the easy part. Translating the content of these posters into a daily reality within an organization is the real challenge, but one which is worth the investment and is potentially very costly to ignore. How can we encourage and make these values come alive in our work culture? List specific individual, group, and management actions, recognitions, and practices that will make the value grow. How should divergence from our agreed upon shared values be handled? To stimulate your thinking, review this list of values circling those that are most important to you. Click here for the Word document.